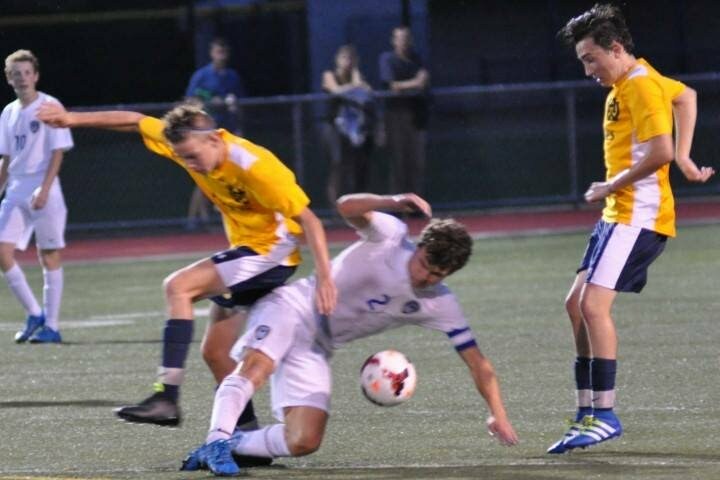 Even though the game ended 15 minutes early due to lightning and thunder in the area, the season opener for the Walnut Hills soccer team against Wyoming was every bit the thriller it was predicted to be. The match was packed full of highlights but ended in a 0-0 draw. save the score remained 0-0. The Eagles on the other hand had plenty of chances. Their first real chance, even though it was called offside, came off a set piece delivered by Flanagan. Senior Lee Workum, the shortest player on the field, climbed the ladder and put an incredible header on frame that prompted an equally impressive save from the cowboys’ keeper. The most threatening chance for the eagles came off a shot that pounded off the post from senior Randall Smallwood. The build up play to put Smallwood in the clear started with junior Colin Moreno picking off a pass and then feeding senior Kian Eghbalnia who played a magnificent through ball to Smallwood. It was obvious the eagles had all of the momentum going into the final 15 minutes but the weather had other plans. The eagles will happily take a shutout against one of the city’s best offensive players in Wyoming’s Andrew Derge. With that in mind the eagles know they need to put the ball in the net and they hope to do that against Covington Catholic in their home opener this Thursday at 7pm. The colonels come in ranked #11 in the nation and it figures to be another thriller of a game.